Knitters Need the Right Tools! 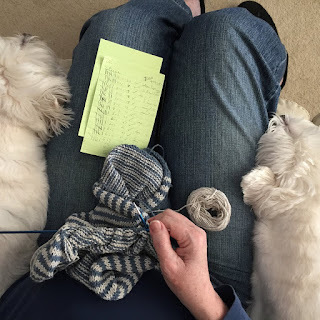 March Knit Blog Update! March was a whirl of focussed knitting on my latest project, Bondi by Martin Storey from the Ocean Blue Collection in Rowan Denim Revive! Whilst knitting my Bondi, it became obvious that I was using the wrong needle tips! This led me to have a look at my needle collection....primarily Addi with a little Signature and KnitPro thrown in! Every Knitter needs a variety of tools...right? Join me while I discuss the merits of the different needles in my collection. It's a short update....sorry, but I've been too busy knitting! February Update - Summer Project on the Needles! February was brutal here at Life LDC! The weather was horrendous....so L&D and I snuggled up on the couch and got going on a summer project! A bit of swatching happened along the way. Spring MUST be just around the corner - right? Sometimes Saying Goodbye.....means Hello to Something Wonderful! I love Denim Revive! It's made of 95% recycled Denim and 5% recycled cotton.....comes in 8 fabulous shades - 3 denim blues, cream, subtle shades of green, pink, grey and the perfect black! My sample balls were used to knit the Sydney hat design and I sort of love it! Check it out in my review video! Moordale - "Made in Britain"
I was so excited to get this new yarn by Rowan on my needles - so I knit up the Buckler Hat and I have to say, I LOVE this new yarn! British Bluefaced Leister and Alpaca combined to make a yarn with personality....lustre and strength, in 12 beautiful shades! The Moordale Collection of 14 sweaters and accessories by Martin Storey has something for everyone! and a behind the scenes look at the photo shoot for the Moordale Collection too! The Moordale Collection is available in print (patterns in both English and German) OR as electronic downloads (buy the collection or individual patterns) at Knitrowan.com ! While I hibernate knit in January (mostly), I did get up off the Life LDC couch and headed to the Handknit Yarn Studio in Hamilton for their "Viola Yarns Trunk Show". 1:49 - Magnolia, the Marie Wallin FairIsle Club - a WIP update! 4:15 - Rowan Big Wool Colour Block Scarf - finished project! 11:00 - the Mari Kondo series on Netflix has inspired me! I've been inspired to "Konimari" "Anne's Stash Room of Requirement! Look what I found - hand spun yarn - a vintage acquisition! 17:13 - "Knits About Winter" by Emily Foden, Trunk Show at Handknit Yarn Studio in Hamilton. Do you take your scissors to your hand knitting? It's called STEEKING, and yes, it seems scary, but it doesn't have to be! It's 2019, and with this new year along with my regular knit updates, product reviews and acquisition videos....I'm planning on doing a series of steek technique videos! My "go to" technique is the first up.....it's simple, clean and probably the most organic way to steek! There's a bonus at the end of how I pick up my stitches. ....It's really cold here and we've got a lot of fresh snow....so Lackie, Daisy and I are having a snow day, watching videos, drinking tea and knitting (of course). I hope you are all safe and warm and enjoying your day too! The LIFE LDC November/December update! 7:00 - ON THE ROAD TO THE LAKE DISTRICT! Join me in the passenger seat for the last bit of the drive! A draw for a copy of Marie Wallin's Skye Cowl printed pattern and your choice of shades of Felted Tweed! 20:30 - THE RETREAT PROJECT! in Marie's British Breeds yarn! 22:45 - A TOUR OF MARIE'S BIG BASKET OF SAMPLE KNITS! Including all of the Bloomsbury and Wildwood samples, the British Breeds accessories collection and Magnolia, the FI Club 4 Project!